Peoria, AZ is an extremely family friendly city. Its proximity to Phoenix and the beautiful backdrop of the Sonoran desert make it a great starting point for many family adventures. No matter if you are into outdoor sports, or a fan of culture and history, you will need a car, bicycle, skates or other method of transportation to get around. And where do you store all those items? In your garage. If you are anything like most people, you are not taken extra great care in how and where you put those items. The result is a garage that is messy and cluttered. 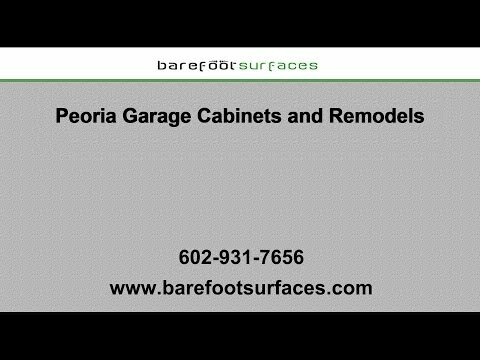 Barefoot Surfaces has over 20 years of experience in the business and additionally to treating your garage floors with the best coats in the greater Phoenix area, we are also professionals when it comes to Peoria garage cabinets. Read below to learn more about why a garage remodel might just be the solution for your messy garage. Barefoot Surfaces can help you to get the garage of your dreams. Once we are done coating your floors with one of our epoxy or polyaspartic coats, adding Peoria garage cabinets is the next logical step. We have been providing top notch customer service along with garage cabinets that work for your garage to Peoria and surrounding areas for many years. Barefoot Surfaces specializes in garage remodels and the creation of spaces that you’ll love to use. We would like to help you to remodel your Peoria garage and turn it into a clean and organized space with a purpose. Barefoot Surfaces is proud to be an authorized dealer of Slide-Lok cabinets. We only work with the best materials in order to ensure that you get top quality Peoria Cabinets. Slide-Lok features cabinets that fit any style or need. Choose from the Tech Series or the Classic Series,or you can even have shelving or drawers added. And how do we know those cabinets will stand the test of time?-Because they are made from plywood and never particle board. If you are unsure of which cabinets and style best suit your needs, we are here to help. Call us today to learn more. Say goodbye to clutter! If you are tired of having a messy garage you can’t use, explore the sleek and utilitarian cabinets from Barefoot Surfaces. A Peoria garage remodel will give you the chance to finally park your car in your garage again. Add optional drawers and shelves to your Slide-Lok cabinet storage to ensure that every item will find its perfect place. No more tripping over inline skates or searching for your screw gun. Safely store away garage clutter and protect it from unauthorized access, pests and the weather. Contact Barefoot Surfaces today! Give your Peoria garage the makeover it deserves. Why shouldn’t your garage be a stylish and sleek extension of your home? With our garage cabinets your old and dated garage will transform into the garage of your dreams. To pull it all together, have Barefoot Surfaces apply on of our many fantastic Peoria garage floors coats as well. We can make your garage floor more durable and enhance its look with stains or coats. Learn more about our services including Slide-Lok cabinets, floor coatings and Peoria garage remodels by calling 602-931-7656 or email Ric at Ric@barefootsurfaces.com.